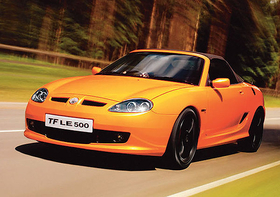 NAC relaunched the MG TF roadster, in LE 500 form, in the UK in September. Nanjing Automobile Company (NAC) bought MG Rovers assets in July 2005, three months after the UKs last domestically owned volume carmaker collapsed through financial difficulties. The new name will help strengthen the companys reputation and re-emergence in the market by emphasizing the already well known MG brand, the company spokesman said.